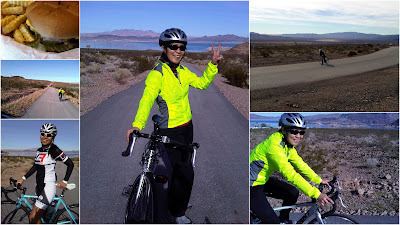 My friend and co-worker Wendy had not ridden a bike since she left China to study in the states. Hearing of my passion for cycling, her adventuresome spirit left her wanting to experience the joy of bike riding again. So I met her last Saturday at JT's Bicycle where she rented a road bike. Since this bike was probably a different than the commuter bike she had ridden, we went to a flat area of the River Mountains Trail so she could get to use to pedaling, shifting gears, and stopping. I had asked the tech at the bike shop to replace the clipless pedals with the standard ones to save her from clipping in and out or worse--falling over as I had done the first time I was out on the road. After she rode back and forth and was comfortable with the bike, we were ready to rock and roll! Soon we were on the River Mountains Loop Trail riding along Lake Mead. Here she is in motion! After 2 1/2 hours in the saddle, we were hungry so we grabbed lunch at Star Burger in Boulder City before returning the bike to the shop. I had a great afternoon sharing the love of cycling with my friend. She did really well and I am proud of her! Then I went home to get ready for my cycling team dinner. Awesome! That looks like fun :) You are so talented with all your photos and videos on the bike Daly! Thank you :-) I enjoy capturing memories for others and looking back at the photos and videos to see that we did indeed have a great time.